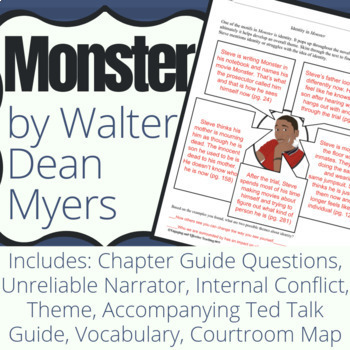 Resources to use when teaching Monster by Walter Dean Myers to high school students. Pre-reading Powerpoint for screenwriting and courtroom terms. Includes a link to a YouTube video of a theater group's trailer for their production of Monster. 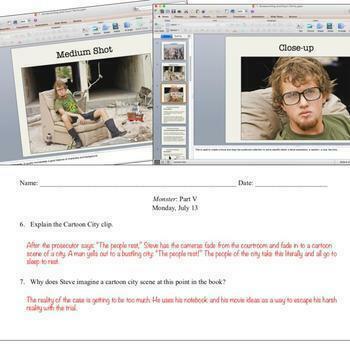 Worksheet for students to write down the definition for each term and the purpose of the different camera shots. 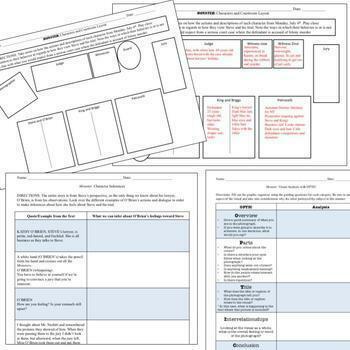 Courtroom graphic organizer to help students visualize the setting of text and to organize information on each of the characters and how they are involved in the case. OPTIC worksheet for visual analysis of one of the photographs in the text. It's blank, so it can be used for any of the visuals, but the answers are provided for one visual in particular. This helps students analyze the visual and its relationship to what is happening in the text. Guide Questions and Answers. 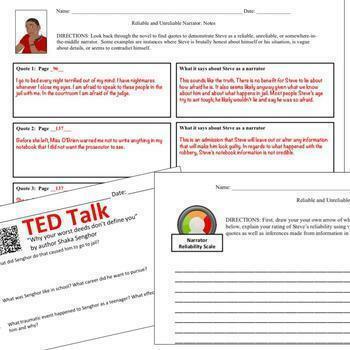 Created to get students thinking beyond what is written in the text. The book itself is not broken up in chapters, so most of the guide questions are divided by dates. The questions are divided into eight different parts, but they can be combined or divided again as needed for the class. Internal Conflict and Making Inferences. Graphic organizer to help understand the complex relationship between Steve and his lawyer, O'Brien. Students make inferences about how O'Brien feels towards Steve throughout the trial. Students analyze her internal conflict about defending a man she believes is guilty. Theme. Students gather examples of identity throughout the text in order to identify the theme of the text. There is a link and accompanying questions for a Ted Talk about how your worst deeds don't define you. Students will find similarities between the two and use information from the talk to understand what Steve needs to do in order to move on after his trial. Reliable and Unreliable Narrator. Steve is both brutally honest about his fears and general thoughts in jail, but he also lies a bit. Students will either gather their own quotes or use the quotes provided (both forms of worksheets are included) in order to determine how credible Steve is as a narrator. There is a Prezi on narrators and a worksheet for students to take notes about each type of narrator. The Prezi is available for free online and is not included in the price of this product.